Nearly every small business has a website, but what are you doing to stand out when potential customers are looking to buy? Just having a website isn’t enough anymore. You must be on the 1st page of search engines like Google, and SEO is the way to get there. Unfortunately, many small businesses have been priced out of this critical service, or been forced to put up with low-quality providers that are outsourcing the work to the other side of the world. We’re here to change that by offering local, effective, affordable SEO plans to help small businesses grow. Call us today to find out how we can help you drive more web traffic and increase sales. SEO is Search Engine Optimization. It’s the work that goes into your website to show search engines, like Google, that you’re the best result when customers are searching for your product or service. The ultimate goal of SEO is to get your website to the top of the list. So how does Google know which sites to put on the 1st page of results? Google evaluates your website based on two things: RELEVANCE and TRUST. 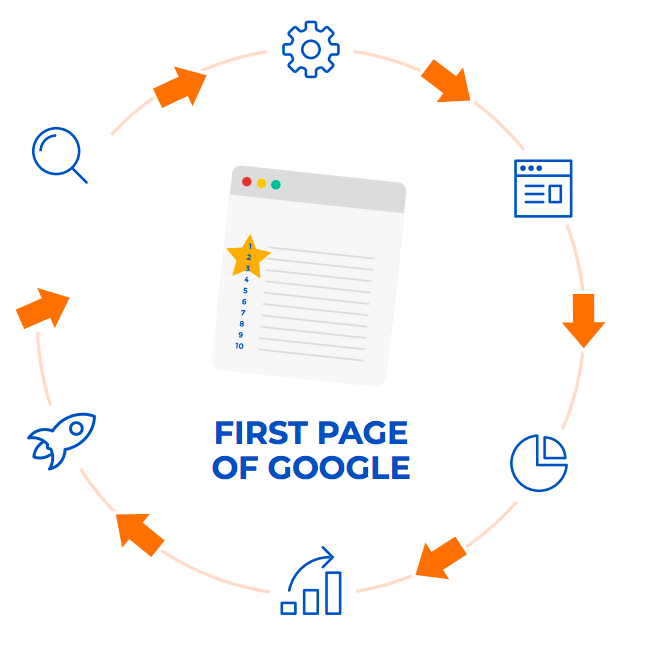 What does the process behind getting you to the first page of Google look like? We promote your business online through high quality content, online business profiles and other time tested online marketing tactics. This will show your website visitors and the search engines that you are a trusted source for the service or product you are marketing. As optimizations to your website are implemented and backlinks are created on trusted sites across the web, your site will begin to move up in search engine rankings. Higher rankings means that more people are finding and visiting your site. You made it! The ultimate goal of SEO is to drive more traffic to your site, which in turn increase sales and grows your business. We make it easy for small businesses to realize the benefits of SEO regardless of their budget. The types of SEO tasks we perform are classified by the time it takes to complete. Basic plans include core SEO tasks like site optimizations and link building, while larger plans include more impactful activities like custom blog posts and articles. No matter your budget, you will always get incredible customer service and transparent reporting tools. Our custom reporting dashboard shows you exactly where your SEO dollars are being used and what impact it’s having on your search rankings. $399Our Bronze SEO package includes all of the core SEO activities that a small business needs to stand out in their local market. This package is designed for businesses with a single location that offer a single product or service in a small area. $993Our Silver SEO package expands the reach and effectiveness of the Starter Package. This option is designed for businesses with a single location that offer multiple products or services in a local or regional market. $1699Our Gold SEO package helps a small business move beyond the mom and pop phase. This plan is designed for businesses with multiple products or services in a competitive regional market, or those who want to start gaining minor national exposure. $2320Our Platinum SEO package includes all of the SEO activities that an established business needs. This package is designed for businesses with multiple products or services in a highly competitive regional market, or those who want to reach a larger national audience.